Acquittal of Ituri warlord and judges' strike expose troubled judiciary. The recent acquittal of former militia leader Kahwa Panga Mandro, better known in the troubled eastern region of Ituri as Chief Kahwa, has sparked a wave of outrage across the sprawling Democratic Republic of Congo, DRC. Although first convicted and sentenced for war crimes and crimes against humanity in February 2005, the appeals court in the northeastern city of Kisangani overturned that verdict, saying Chief Kahwa was covered by the country's amnesty law. Human rights activist Joel Bisubu of Justice Plus in the Ituri town of Bunia described the verdict as worrying saying it sets a dangerous precedent. Bisubu is concerned the acquittal "will enable most of the alleged criminals to get away from justice, while victims would remain abandoned without any compensation or reparation". Chief Kahwa headed the Party for the Unity, Protection and Integrity of the Congo, PUSIC, and was convicted for the October 2002 killing of ten people after he set fire to a health centre, schools and churches southeast of Bunia. In August 2006, Kahwa was sentenced to 20 years in prison and ordered to pay 14 victims of his crimes between 2,500 and 75,000 US dollars in compensation. In 2005, DRC passed an amnesty law covering acts of war and political offences committed between 1996 - when the rebellion against the former ruler Mobutu Sese Seko began - and June 2003, when the country's transitional government was set up. It does not cover war crimes. The court's use of Congo's amnesty law in connection with the massacre of civilians, said UN spokesperson in Congo Kemal Saiki, was a "worrying [development] in the fight against impunity in the DRC". The general prosecutor of Kisangani, Chris Aberi, said he intends to appeal the ruling at the DRC supreme court. "These facts amount to war crimes and crimes against humanity, even if they were not categorised as such in the Congolese criminal code at the time," said Aberi. Nestor Botela, also a local prosecutor, explained the decision, "The magistrates of the Court of Appeal of Kisangani, who rendered the verdict, based their decision on the grounds that all offences that Kahwa is accused of are covered as acts of war and political offences by the amnesty law." But Botela doubted the validity of the court's interpretation of the amnesty law. The court's decision was widely criticised and may be linked with the recent strike by Congolese judges who protested a host of judicial dismissals and appointments made by President Joseph Kabila. The magistrates who delivered the February 15 verdict, were among those forcibly retired by Kabila who was trying to restructure a judiciary widely viewed as corrupt and ineffective. Earlier this month, Kabila forced 92 judges and prosecutors into retirement, including the supreme court chief and the attorney general, replacing them with 26 appointees. Incensed, the judges shut down the courts for seven days, saying Kabila's move was an assault on the constitution and an independent judiciary. The judges complained that the judiciary's top governing body, the Supreme Council of Magistrates, was the only legitimate authority to retire judges. But, noted critics, the council had never been assembled, even though it was created in 2006. The strike closed most courts in Kinshasa and several other provinces, but two other Congolese judges' unions did not join the strike and some cases were heard, including that of Chief Kahwa. After a week, the judges ended the strike following agreement on a compromise with Kabila. "We have had contact with authorities who have given assurances the decision would be improved," the head of the judges' union SYNAMAC, Sambayi Mutenda, told the Reuters news agency. "They will treat [the firings] case by case and not put everyone in the same bag." Jean-Marie Eley Lofele, a lawyer and human rights activist, said corruption is prevalent in the courts, but Kabila didn't help matters by meddling with the constitution. "The president infringed the constitution with his decision appointing senior magistrates without taking into consideration the [the Supreme Council of Magistrates], but he is right in pointing out the malfunctioning of the judiciary," he said. 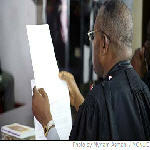 Corruption, he continued, clearly is a problem in Congolese courts, "The whole system [is] corrupt. Where they can find an interest, magistrates proceed quickly with the verdict. For poor people, it is difficult to get a fair and rapid judgment." It was such turmoil in the courts that has opened the door for the International Criminal Court, ICC, based in The Hague, to investigate and put on trial various militia leaders in eastern Congo. Those leaders include Thomas Lubanga, who is scheduled to go on trial for war crimes and crimes against humanity later this year. The ICC also has in its custody Germain Katanga and Mathieu Ngudjolo, both militia leaders accused of war crimes. The most recent to be arrested, Mathieu Ngudjolo, a Congolese national and alleged former leader of the National Integrationist Front, FNI, was a colonel in the Congo army. Eddy Isango is an IWPR journalist in Kinshasa.